Since this month is the first time that I'll have to make two cakes, I thought I'd finally get this post up for my own reference. I often go back and look through the pictures of previous cakes to get ideas or make sure I don't do something too similar to an earlier cake. By posting the cake pictures here, it puts them all in one place (that saves time) and I can add a few of the notes and stepping stones I've learned over the years. 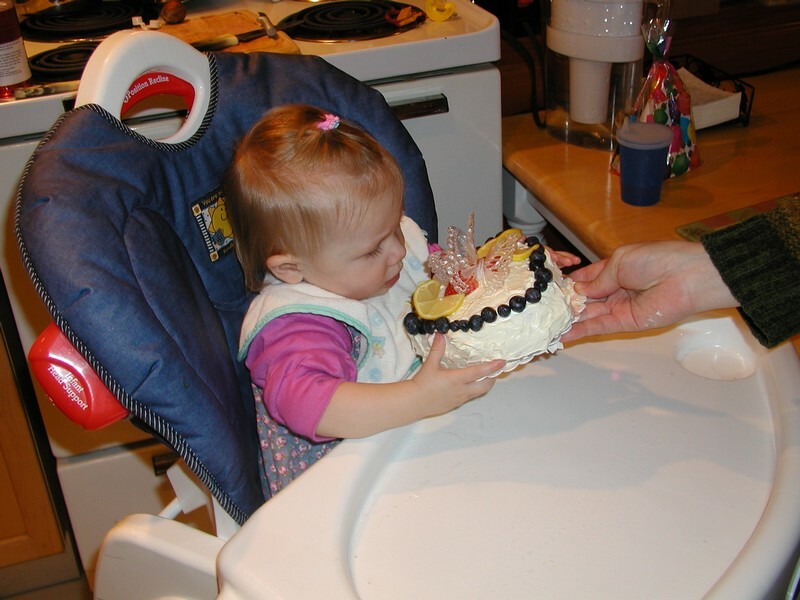 And start with Dolly's first birthday. January, 2006. 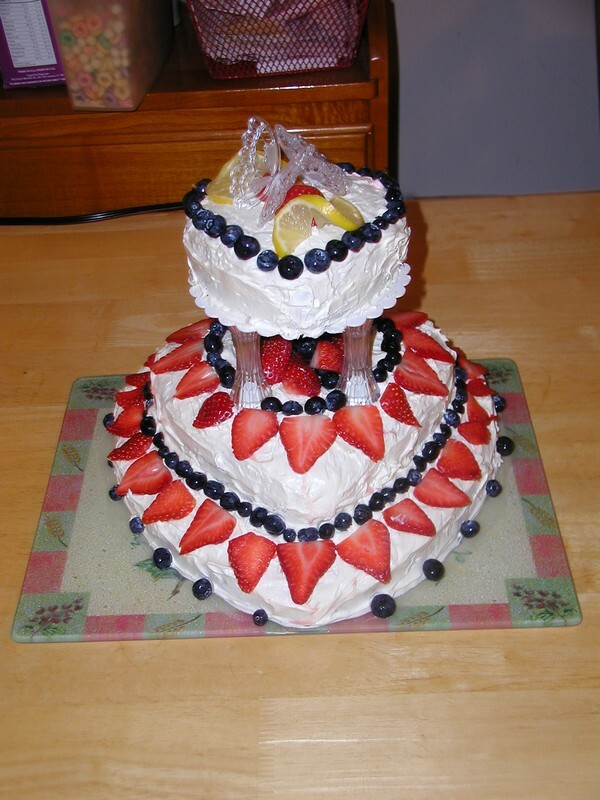 This was back before I discovered the buttercream icing recipe. It was whipped cream. As a new mom I think I was going for the 'healthy' version of birthday cake, although it wasn't until sometime after her birthday that I was informed by the public health nurse that strawberries were an 'potential allergy' food. Apparantly, you weren't supposed to introduce them to your baby until about 2 years old. At that point Dolly had been eating them for six months already, but I didn't say anything. :) Dolly was just happy to have the freedom to pick off the blueberries finally. Next up: The cake I didn't make. January, 2007. This cake was made by a friend who was staying in our area for a short while. 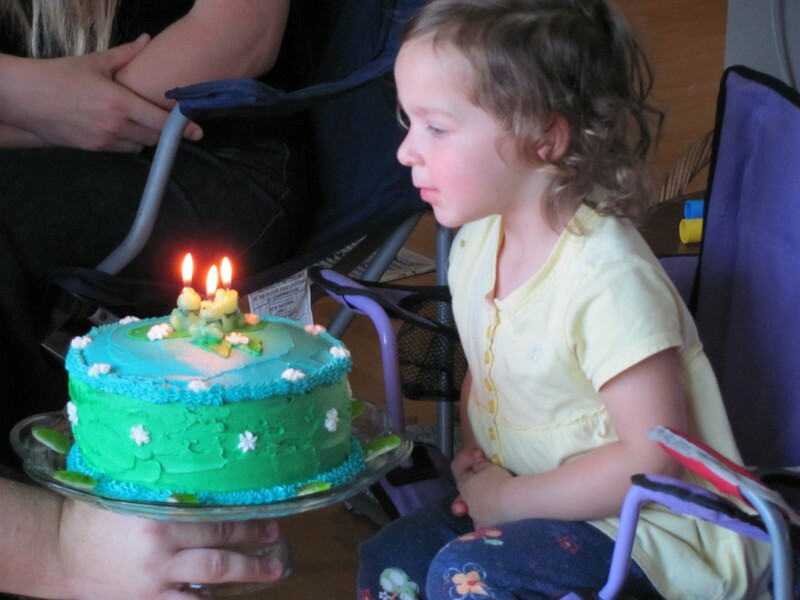 She had offered to make a cake for Dolly's birthday and I was only too happy to accept as I was in the early (exhausted-all-the-time) stages of my pregnancy with Emma. I was very impressed with this cake (especially the grass at the time) and learned the value of pre-making little flowers and freezing them for easier handling. 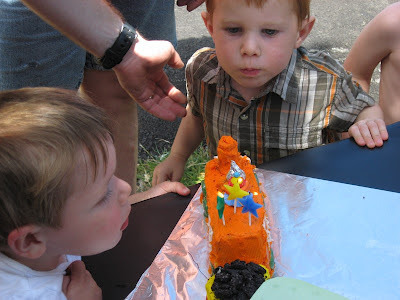 I used that tip on my own cake a few years later. 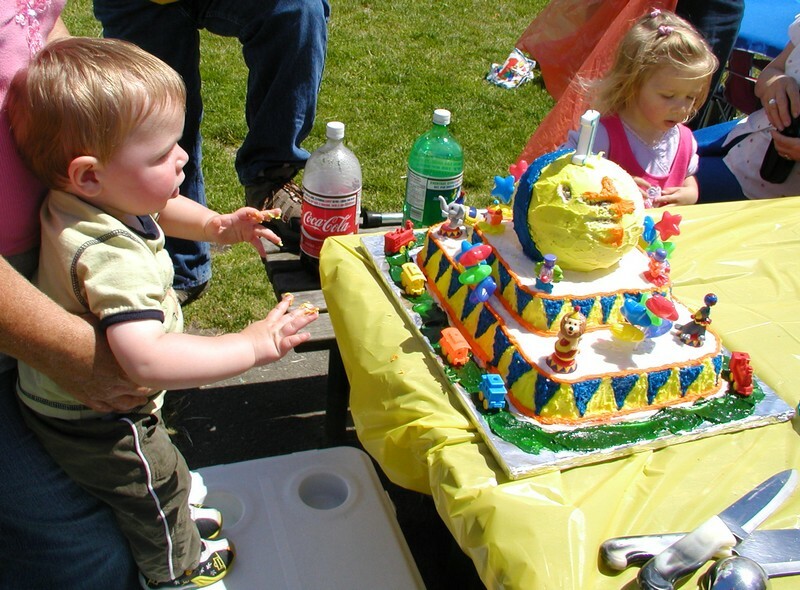 The biggest cake you ever did see any 1 year old ever got. June, 2007. Obviously, I was out of the exhausted-all-the-time stage of my pregnancy with Emma, and well into the can-do-just-about-anything stage. For this cake, I knew I wanted to do something circus-y and I definitely wanted a ball and some plastic balloons. So, I found a cake shop two towns away from where we lived, that would rent me a ball mould. 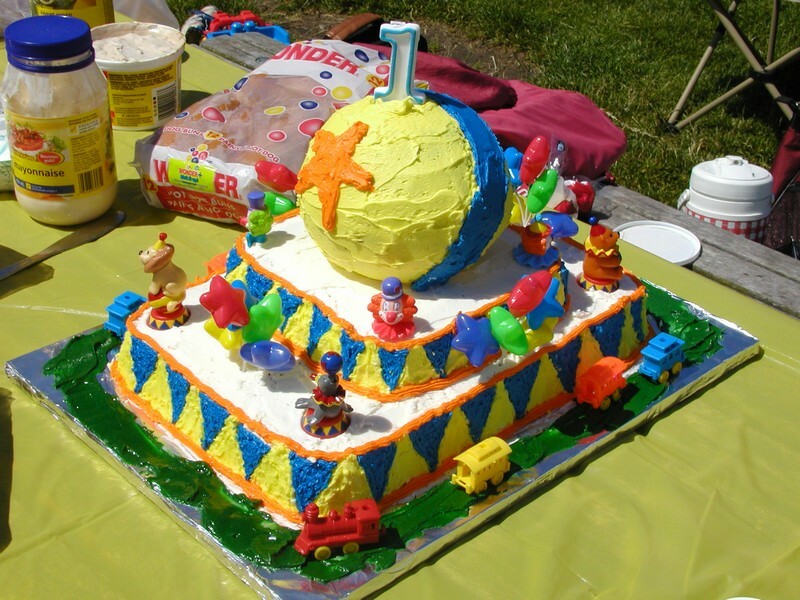 It turned out they had all sorts of other perfect stuff for a circus cake too, but the most valuable thing I came away with was a buttercream icing recipe (I should post that one of these days). I had wanted to find an icing that would hold up to being outside in the sunshine for a couple hours, and this is what the shop owner suggested. It's been exactly what I needed ever since and I've proven this icing over and over again. This was also the cake Sir made a cake board for me. To make everything in my head in real life, I was going to end up with a big cake and I didn't have a cutting board big enough to hold it. And ever since, this board has held almost all of the birthday cakes around here. With this cake I learned that there is never any circumstance that one would need THREE boxes of cake mix for a child's birthday cake. We had leftovers in the freezer for the next 6 months! That ball alone was a whole box of cake mix. I also learned that when my decorating is about to take a nose-dive to disaster via panic/stress-ville, that Sir can and does come to my rescue. This has been proven again and again over the years as well. Lastly, I learned that the ball mould pan was pretty much the exact same thing as a number of my mixing bowels. So, for a ball at least, there's no need to pay an exhorbant rental fee and stress over a two day deadline. PC just wanted that ball! You can see his finger tracks through the star. The Jelly Belly Jello cake. January 2008. Dolly's third birthday probably had the simplest and least creative cake that I've ever done. I remember feeling bad that it wasn't as nice or better than the ones before it. 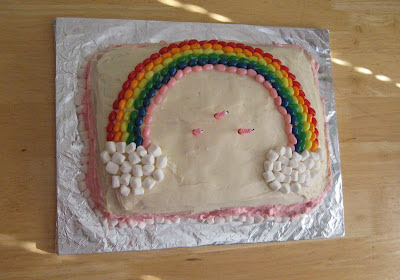 Maybe I was still adjusting to three kids under three, but whatever the case, I didn't feel very creative, and you couldn't get much simpler than store bought icing for the top, whipped cream and strawberry jello mix for fluffy pink sides and a rainbow of jelly bellies and some mini marshmallows for the finishing touches. Thankfully, 3yr olds don't seem to be too picky or have definite ideas of what they want for a cake, so it was just me who thought I could have done better when all was done. I did learn that you don't need nearly as much candy to actually decorate as you think you do when you're at the store. We had a jar of Jelly Bellies kicking around for a long time after that birthday. 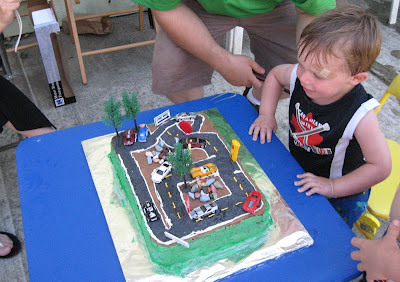 The Car cake - or adventures with food coloring. June 2008. Grandma C. had given PC some adorable mini model cars a couple weeks before his birthday and when I first saw them I knew they'd be perfect for a birthday cake. But how do you make white buttercream icing black? Every car cake need some blacktop to drive on! So it was back to the cake shop for me. 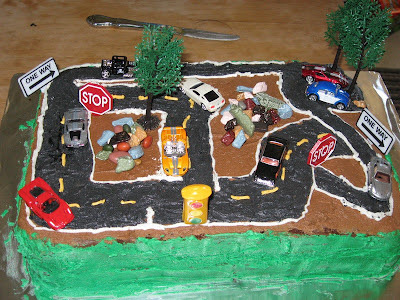 They had road signs, mini trees and even edible rocks! And, they had black food coloring. Just a note though, if you ever need black icing for a road, you probably don't need very much. I dyed a moderate portion of icing and it ended up being way too much, but it was all good because the excess black icing led me to another lesson in cake making a little later that year. But to make white icing black... it takes a LOT of food coloring. I think if I ever need black icing again, I'll start by making a dark color like blue or red or purple and then turn it black... it would probably end up using less black. The best part was PC's opinion. Cars were totally his thing (I think that's true for any 2 year old boy) and he loved his cake. Reactions like this make all the work and extra hours worth it! M&M's for Emma. September, 2008. 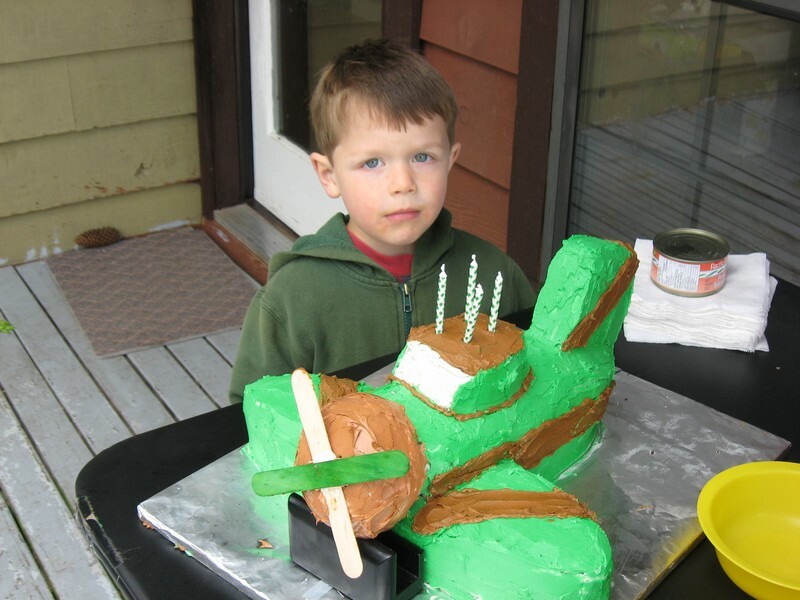 Now for each kids' birthday cake, I try to take into consideration what they are like and what they like in general. If I had to sum Emma up at one year in a single word, it would have been 'candy' or more properly pronounced, 'can-nee!'. I also had a sandwich size ziplock bag of black icing in the freezer leftover from PC's Car cake, so this was the cake I discovered the practicality of using leftover icing for the inside of the cake. I'd always put a layer of icing between the two cakes to sort of 'glue' it together, but it had always been some of the white icing that I was using to color the rest of the cake. I also learned how some kid toys can be the perfect thing for various cake parts. 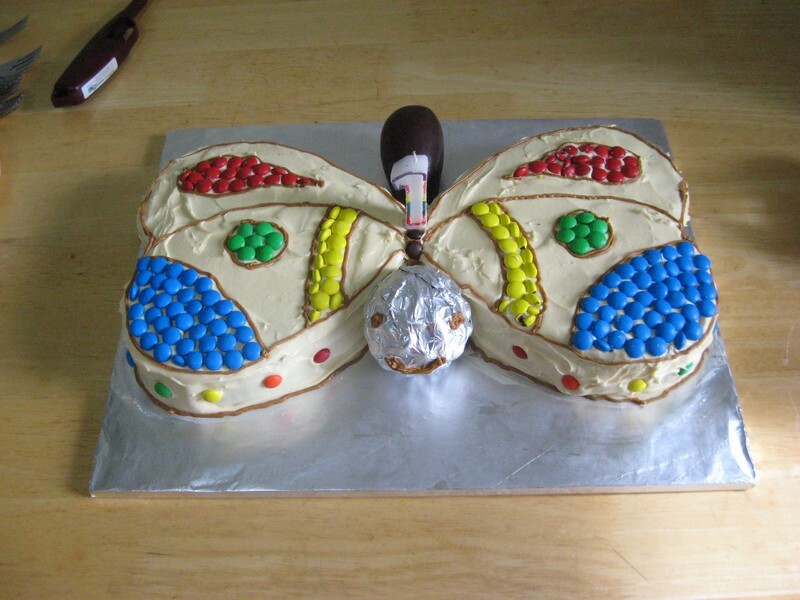 The butterfly's body is actually a plastic eggplant from the toy food collection and his head was the crumpled aluminum foil I'd tried covering the cake board with before messing up. I've since used toy dishes, business card holders and even the clear plastic from a strawberry carton for cake accessories or props. I think all Emma cared about was getting to all that candy! 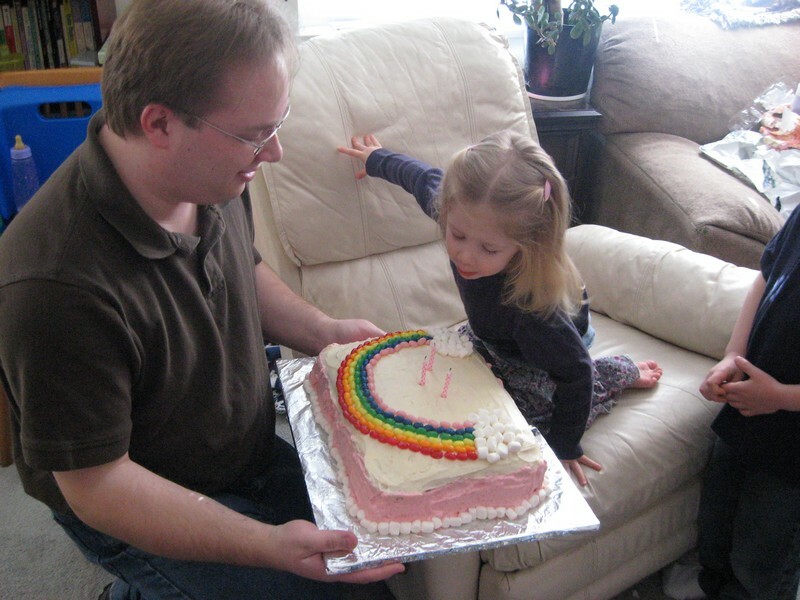 You can see her straining to get out of Sir's arms and to her cake. On to January, 2009! 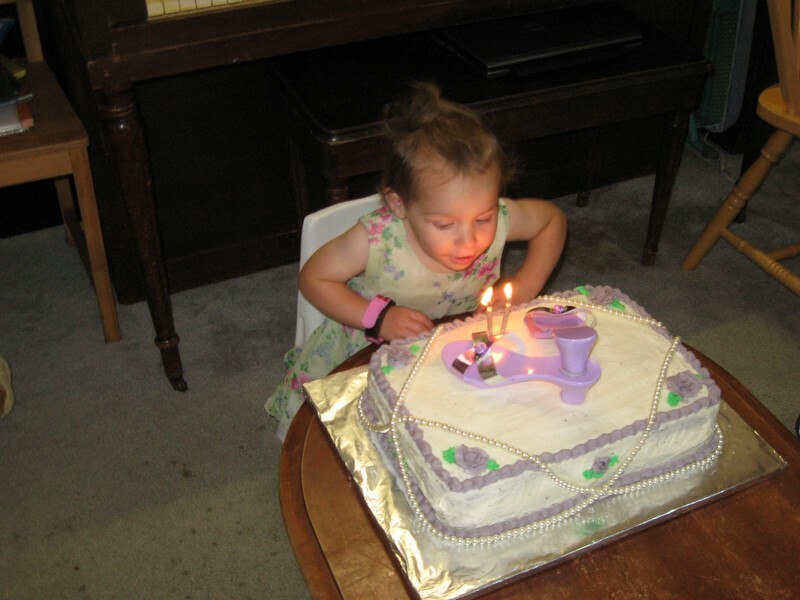 Dolly's 4th Birthday. Dolly wanted a princess birthday that year. We even made princess doll invitations. But I wasn't ready to make a big 'doll cake' that year. 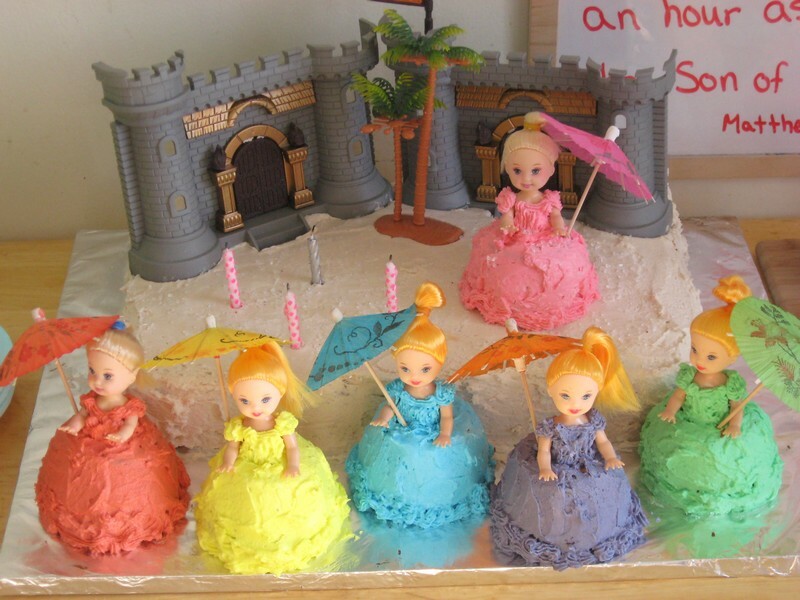 Instead I made a bunch of cupcake princesses and put a dollar store castle front on a half-height sheet cake. I figured the adults could eat the castle cake and each guest kid (including my own kids) could have a cupcake. 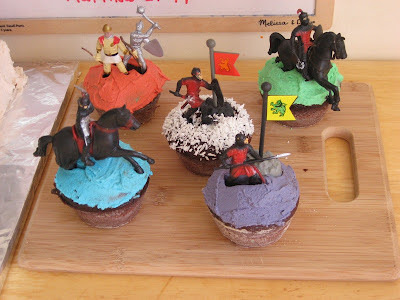 Of course the boys weren't going to appreciate little princesses, so we stuck some Medieval soldiers on their cakes. Then all the kids got to take the toys home which was fine with them. 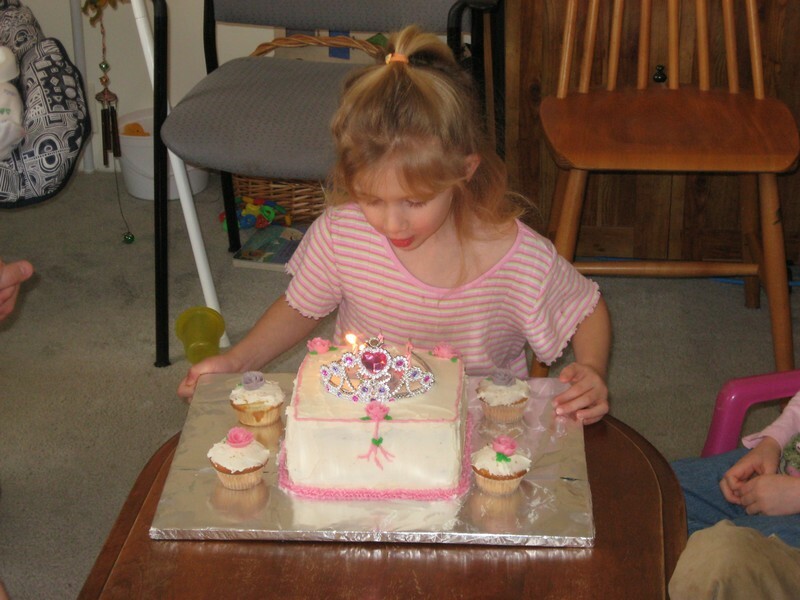 I had great visions of sparkly princess dresses, but the sugar sprinkles didn't really work. I think if I aim for sparkles again it'd probably be better to go with edible glitter. The Undocumented Cake. June 2009. 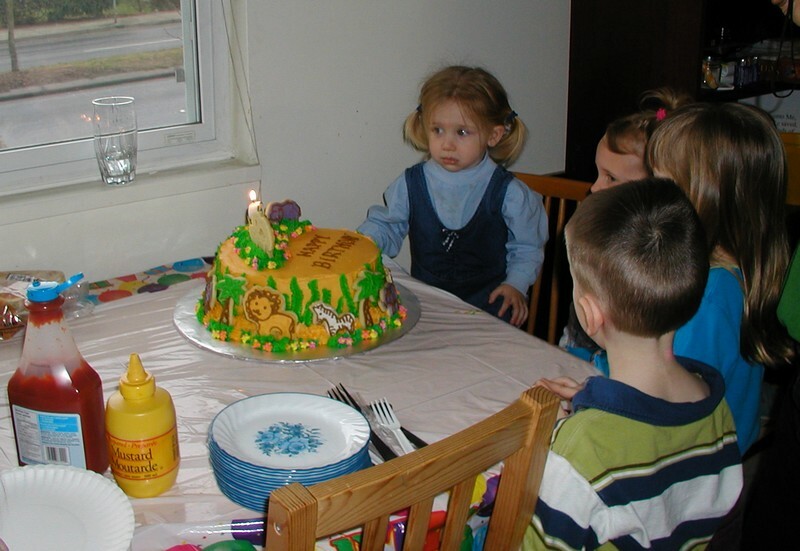 This cake was a masterpiece, and I lost all of it's construction documentation along with about 400 other pictures. For each cake I take pictures of the pans I used to get the shapes I ended up with and I take pictures throughout the building process so I can see how different ideas worked or didn't work. 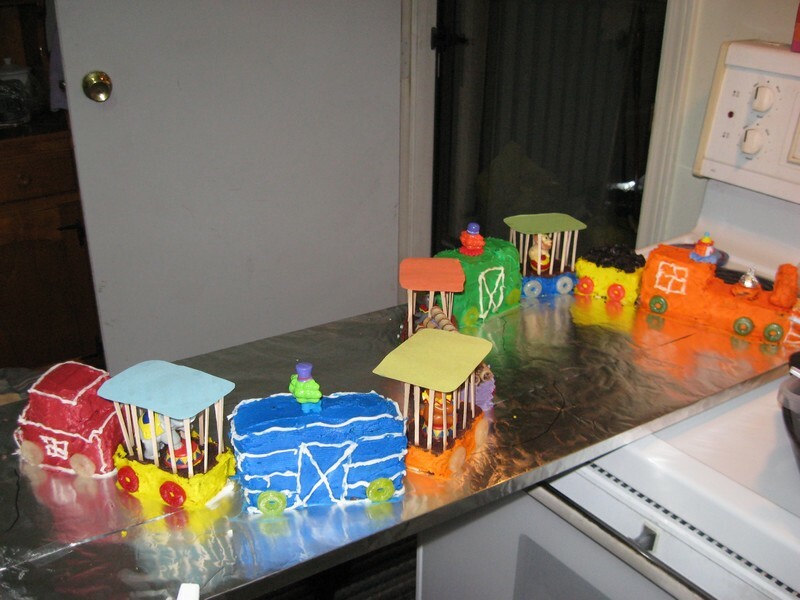 I used the same circus animals from PC's ball cake for the cage cars, but there was a lot of other fun stuff to this cake like the oreo crumbs coal load and the hazelnut logs. Poor Sir searched high and low to find those logs for me. They're all over the stores at Christmas time, but pretty hard to find in June. I had to modify the cage tops - they're half craft supplies all paper and glue. I had tried balancing a thing piece of cake on top of the craft sticks, but the cake wasn't going to hold up. Then there was the problem of a cake board. PC's party was going to be at a park about 15 minutes away by car and I needed to be able to transport the cake in one piece. This was one time my special cake board was too small. So, I raided the pantry and used a pantry shelf. But once the cake board was figured out and the cake was assembled (in the wee hours of the morning) I realized there was no way that cake was going to fit in the refrigerator. And it needed to be refrigerated before heading out in the June sunshine for lunch. The solution to this was re-arranging the chest freezer out in the shed in the backyard and puzzling the pantry shelf cake board in at a pretty steep angle and leaving the lid not quite closed. I took pictures of it all and just before I went to bed I moved them to the computer. And that night that computer crashed and we lost everything that hadn't been backed up over the last 24 hours. Which was pretty much just whatever was on the camera the night before. A whole month of pictures including the videos and still of the kids' reactions to finding out Butler was on the way. We announced that pregnancy at PC's party. 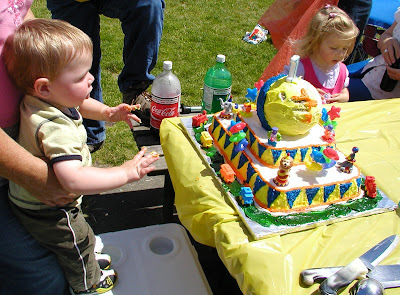 This was the only other picture I have of the cake because I was too busy at the park to take pictures of it, but at least PC's in the same picture - even if you can't see him very well. 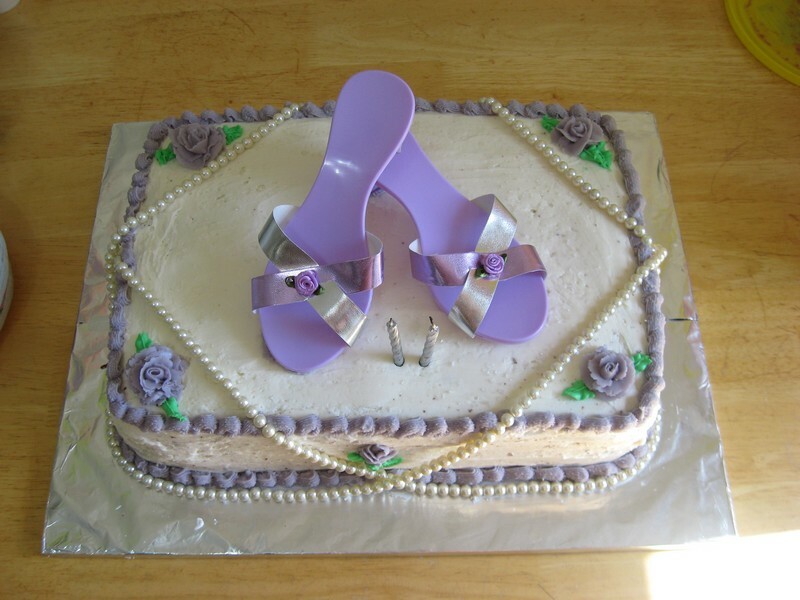 The Shoe cake. September, 2009. The wonderful thing about approaching 2 years old is that individual personality and preferences really start to come out (I guess the negative side of this is the Terrible Twos). 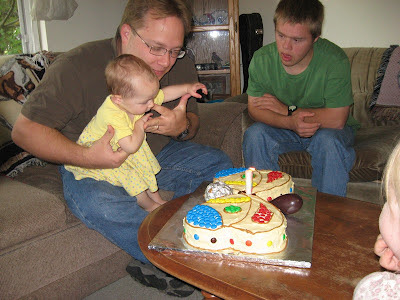 But when you're eight months prengnant it's really nice to have a battery of ideas for birthday cakes based on the birthday kid's likes. Emma made it sooo easy for me - she loved (and still does, actually) ALL things dress up. Especially shoes and accessories. 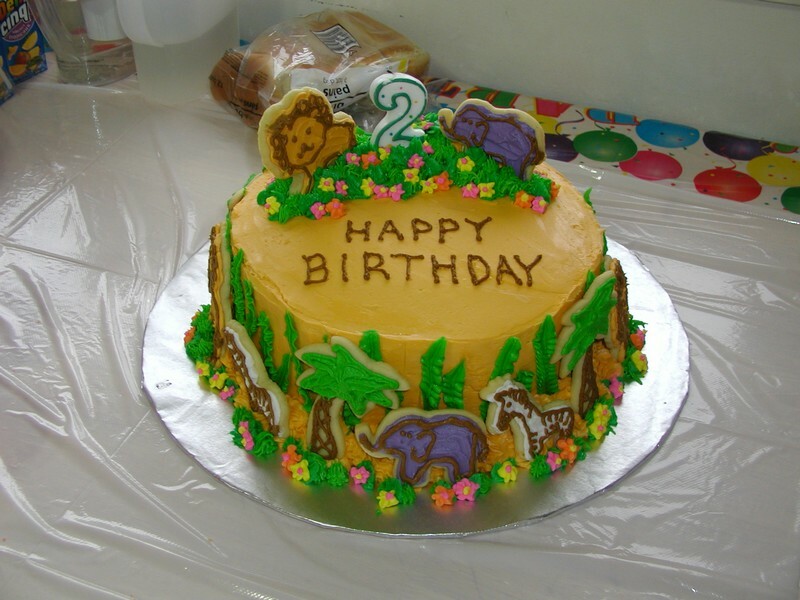 I think this cake is still one of my very favorites. It was the first time I tried making flowers, and they turned out just as pretty as I had hoped! And she got to keep the shoes as one of her gifts which made her day. I kept the bead necklaces though, as I figured they might come in useful again later. I was rather pleased with how they turned out on the cake too. You see, I didn't want to cut the necklaces, but I wanted them to drape across the cake and still look pretty. After a lot of experimenting I finally figured it out, and it was just right! One very important thing I learned with this cake was to check for icing crumbs before settling on which side is the front of the cake. It turned out that the back of the cake was almost perfectly crumbless. This was also when I realized the sense in 'priming' a cake to seal in the crumbs before icing it with the colors I want it to end up. The Crown cake. January, 2010. As you can see, I must have had a good deal of purple icing left over from Emma's shoe cake and I hadn't gotten the roses out of my system either. 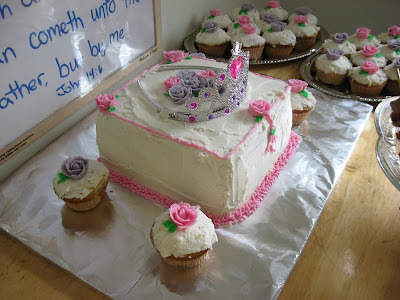 I think Dolly had asked for another princess cake, but I didn't want to do the cupcake princess route again yet and I still wasn't ready to try a full-size doll cake. So, I stuck a new dress up crown on the top and we called it a 'princess' cake. I liked the smallness of this cake. It could have had a few straighter sides and I did not like how the tassel in front turned out, but this cake was the beginning of the smaller main cakes. They definitely fit in the refrigerator better and I like the cupcakes on the side as well. With cupcakes, if you don't have a lot of guests that want cake, you don't have to cut the big cake and have most of it dry out before you can slice and freeze the rest of it for deserts later. The Airplane cake. June, 2010. PC told me he wanted an 'airplane' cake for his birthday that year. I did not realize how hard it was going to be to build it when I agreed to make it for him. It wasn't just finding the right sized/shaped pans, or creating a symmetrical design that was the main difficulty. The hard part was putting it together so it would look real. I wanted the nose off the ground a bit, but keeping it there, or the tail up for that matter, a challenge. But I learned how to dowel pieces together with the airplane cake. I used chopsticks since that's what I had on hand, but without pinning that cake together it wouldn't have turned out at all. I think the general consensus was approval and PC was happy with it, which was what mattered the most. I don't think any of the kids noticed that this plane had no wheels and I made sure not point it out either. 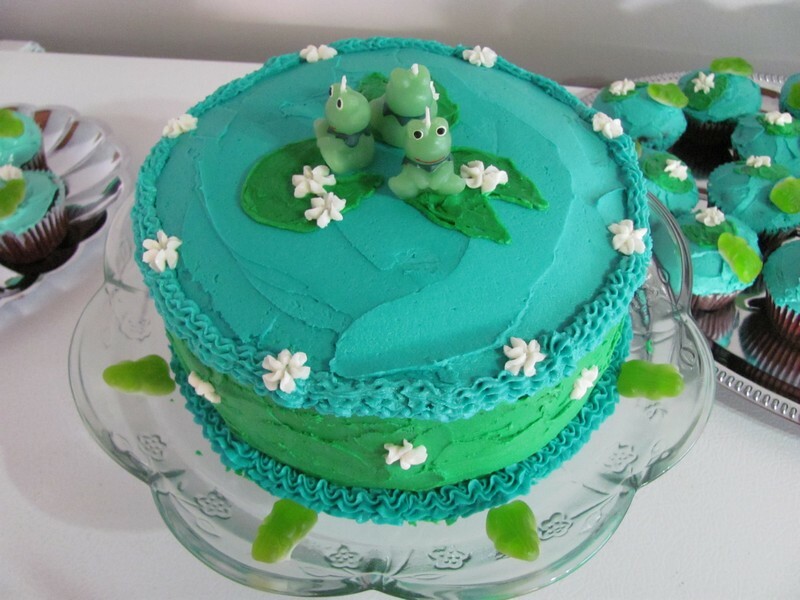 The Frog cake. September, 2010. 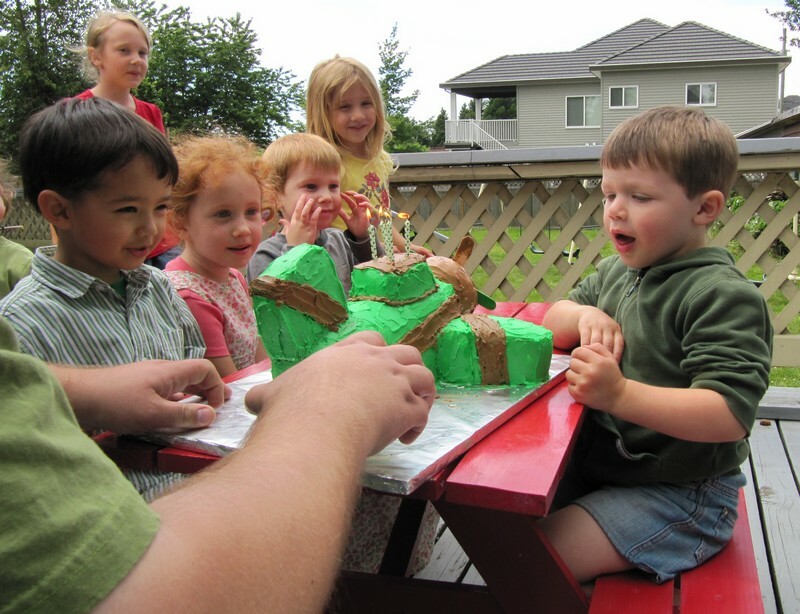 I wasn't quite sure what Emma meant when she asked for a 'frog' cake that year, but this was what I came up with. I think she must have really liked it because every time I talk about PC or Ricka's cakes for this month, she makes sure to put her 'order' in, just in case I was wondering. I keep reminding her that her birthday is still a ways off, and we can plan her cake when we get closer to her birthday. This was the first round cake I made and I really liked how it turned out. I experimented more with flowers and finally put the 'flower tip' I learned at Dolly's second birthday to use. It was so much easier to place the little white flowers after they'd been frozen on a piece of wax paper exactly where I wanted them, than trying to make them fresh right onto the cake. And after starting this post on the 5th, and working on it for a week, this is how far I got before it just started sitting in my draft folder while I've been meaning to get around to finishing it. So, I'm just going to post this now so it doesn't wait any longer! And the plan is to put the rest of it up as Part II. We'll see how long that takes. I have to hate you for your super awesome cake making skills. Haha! Definitely NOT one of my talents. In fact, my children have told me not to bother trying. These are AMAZING! I am SO impressed! Good job!